UnitedHealth Group Inc. and Humana Inc. will begin offering smaller employers—including firms with as few as 10 members in UnitedHealth’s case—the option of so-called self-insurance in some markets later this year. 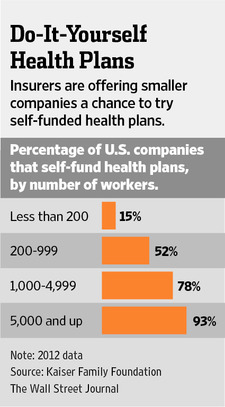 Self-insured businesses pay their workers’ medical costs directly, instead of joining a traditional managed-care plan. Usually, they hire benefits firms or insurance companies just to administer their plans. Now, the health law is changing the risk-benefit calculation for smaller businesses such as Buckno Lisicky & Co., an 85-person accounting firm in Allentown, Pa. The company switched from a traditional health plan to a self-insured plan run by benefits-manager WellNet Inc. this year, in part because of the law’s small-business rules, said Jack Lisicky, a founder. “The big guys have a lot more flexibility and that’s what we’re trying to get,” Mr. Lisicky said. But strategies like self-insurance would tend to most benefit employers with younger, healthier workers who have lower costs, such as Serenic Corp., an Alberta, Canada-based maker of nonprofit accounting software. The firm will move its 40 U.S.-based workers to a self-insured plan in June, in part to avoid the health law’s risk-spreading provisions that could raise its costs, said CEO Randy Keith. “It was a good option because we do have a relatively healthy company,” Mr. Keith said. Under an existing UnitedHealth plan, the company would have seen a 30% premium increase next year. Serenic’s Denver-based broker, Roper Insurance & Financial Services, said UnitedHealth has been closely tracking the business it has lost to self-insured arrangements. If more healthy companies like Serenic effectively opt out of the exchanges, that leaves their less-healthy counterparts on the exchanges. And that could push up premiums in the marketplaces, regulators say. “You could have a result where the rest of the market…is left with employees that are older and sicker, and as a consequence, rates would go up,” said Dave Jones, California’s insurance commissioner. Officials in several states are seeking to stem the strategy by limiting so-called stop-loss insurance, which covers unexpected, large health-care bills for self-insured companies. Lawmakers in California and Rhode Island are considering bills that would impose new rules on such coverage when offered to small employers, who otherwise would find self-insurance too risky. Some states, including New York, bar stop-loss insurers from covering small groups. Still, self-insurance by small companies “is growing because of its ability to circumvent some of the” federal health law’s provisions, said Tanji Northrup, assistant insurance commissioner in the Utah Insurance Department. Federal health officials said they haven’t seen evidence that these strategies are gaining momentum among small employers. “We think it would be unlikely that there’d be a significant change in the volume of” self-insurance for small firms, said one official with the Department of Health and Human Services. Regulators “remain very confident that the implementation of the new reforms will create a competitive marketplace that offers choices to [small] groups and individuals that they didn’t have before,” the official said. Only about 15% of firms with fewer than 200 workers were self-insured in 2012, compared with 81% of larger firms, according to a Kaiser Family Foundation survey. But, insurers appear to anticipate that at least some small groups—particularly healthy ones—will want to give the self-insured tactic a test drive, brokers and analysts said. UnitedHealth, the nation’s largest insurer, is lowering the threshold for administering self-funded plans to as few as 10 workers, from 100, in at least some markets, according to emails from UnitedHealth sales executives to an insurance broker. Humana also plans to offer self-insurance to companies enrolling as few as 26 workers in some markets where it previously restricted such services to larger companies, according to an email from a Humana sales executive to a broker. Cigna Corp. said it has offered self-funding options to businesses with as few as 25 employees in 26 states and the District of Columbia. “Employers want choices,” the company said. Software Advice Inc., a consulting firm for software buyers that has many male employees in their 20s, is likely to move to self-insurance when the law’s effects kick in for employers of its size, currently 60 workers. The company’s broker has warned the law could mean a rate hike of 30% to 40%, and “that’s not something I want to pay,” said Don Fornes, chief executive of Software Advice, based in Austin, Texas. He said his firm is financially solid enough to bear the risk of self-insurance. A version of this article appeared May 28, 2013, on page B1 in the U.S. edition of The Wall Street Journal, with the headline: Rx for Health Law: Self Insure.